On Tuesday, August 7th, 2012 from 3 to 6 p.m., Shawmut Design and Construction will be hosting a Subcontractor Open House at its offices located at 560 Harrison Avenue, Boston, MA 02118 (use main entrance and check in at the front desk). Interested trade subcontractors are invited to this Subcontractor Open House. This event will be an unparalleled opportunity for smaller, locally-owned businesses to explore the possibility of partnering with larger firms in order to competitively bid on work at the new Dudley Municipal Center project. Food and beverages will be served at this event. 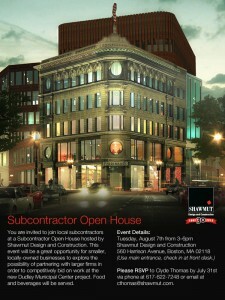 Subcontractor Open House August 7th, 2012, 3-6 p.m. This entry was posted in Construction, Jobs / Contracts, Uncategorized. Bookmark the permalink.